Start your dinner Italian style! 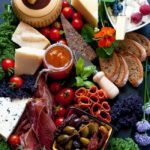 Here are 6 tips for how to make an Antipasto Platter that will meet everyone’s needs and let you enjoy spending time with your friends. Italians know how to host a dinner. They anticipate that their guests will arrive hungry, and yet they know that rushing to get dinner on the table is not the way to enjoy an evening. 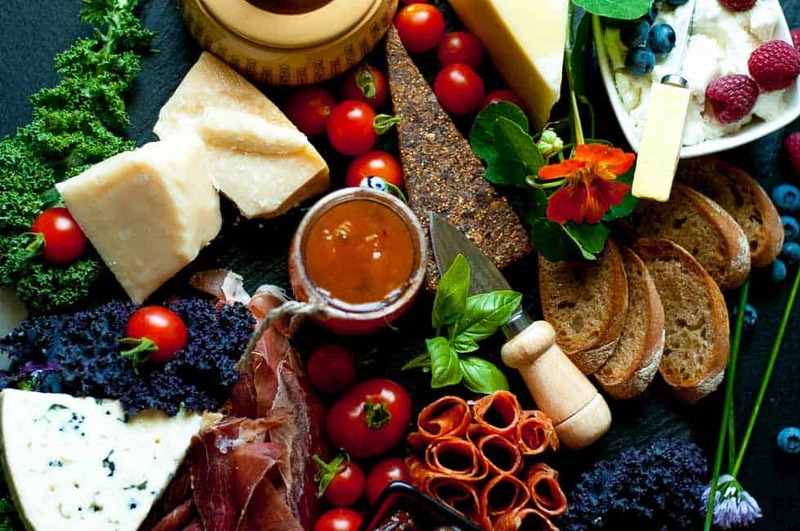 The antipasto (literally translated as “before the meal”) is the beginning of every Italian meal. 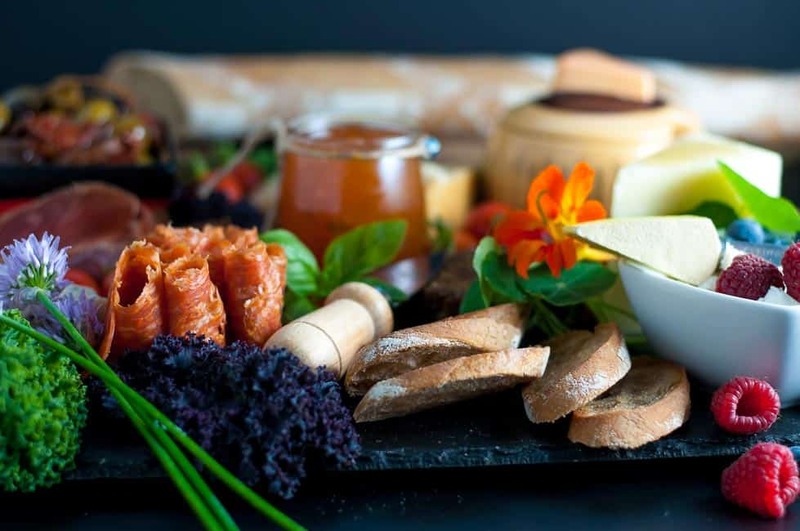 It’s always shared and it consists of a variety of delicacies like cheese, charcuterie, olives or other pickled vegetables, bread and preserves. 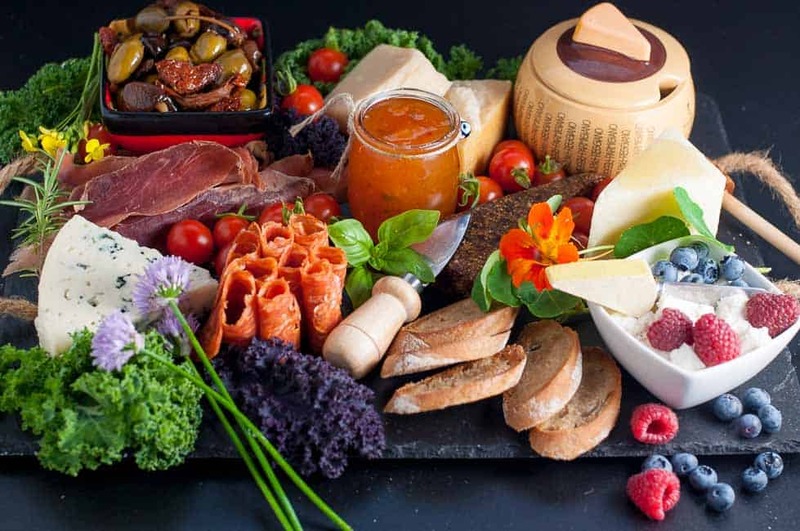 A chacuterie plate or a cheese plate is designed to whet the appetite, encourage conversation and mark the start of an enjoyable meal. During our recent trip to Italy, we found that the antipasto items varied as we moved from region to region. In the south, it included seafood, Pecorino cheese was featured in the hill towns of Tuscany, and Parma ham dominated in the Emilia-Romagna region. Often our favourite appetizer is a simple platter of cheese and olives, like this Holiday Cheese and Olive Wreath Appetizer. To try to recreate those special memories of our time spent in sunny outdoor cafés and cozy trattorias, I assembled a beautiful antipasto platter for our dinner. I used both imported and local ingredients, some straight from my garden. 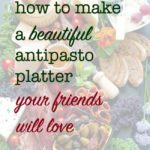 Today I’m sharing six tips for how to make an antipasto platter that everyone will love. 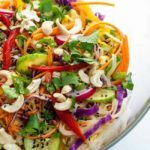 Here’s my step-by-step guide for what to include and how to arrange a beautiful appetizer plate. 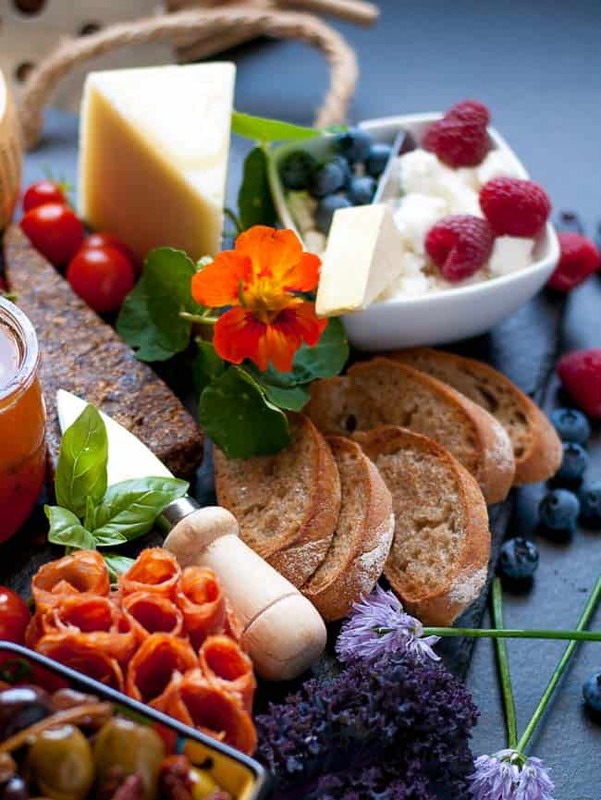 Choose a variety of types of cheese with different textures made from different types of milk. Some of your guests may have an allergy or sensitivity to cow’s milk, but can tolerate cheese made from goat or sheep’s milk. In my platter, I offered chunky Parmigiano Reggiano and soft but sharp blue cheese (cow’s milk), a firm Pecorino (sheep’s milk) and a creamy goat cheese. I find it best to avoid flavoured cheeses on a platter like this, as there are so many other flavours in the cured meats and preserves. Cut some of the cheese in advance to make it easy for your guests to serve themselves. Don’t cut it too thinly, or it will sweat and look positively unappetizing. Provide a small cheese knife for other blocks of cheese. Loosely arrange the cured meats you have chosen so that they are easy to pick up from the platter. I gave each of the prosciutto slices a twist before piling them up and I twirled the capicolla into circles before arranging the thin slices. Offer some pickled or preserved items. I included an olive assortment, a wedge of fig cake and a tiny jar of my homemade Peach Pepper Jam. Roasted peppers, artichokes or sun-dried tomatoes would be good, too. 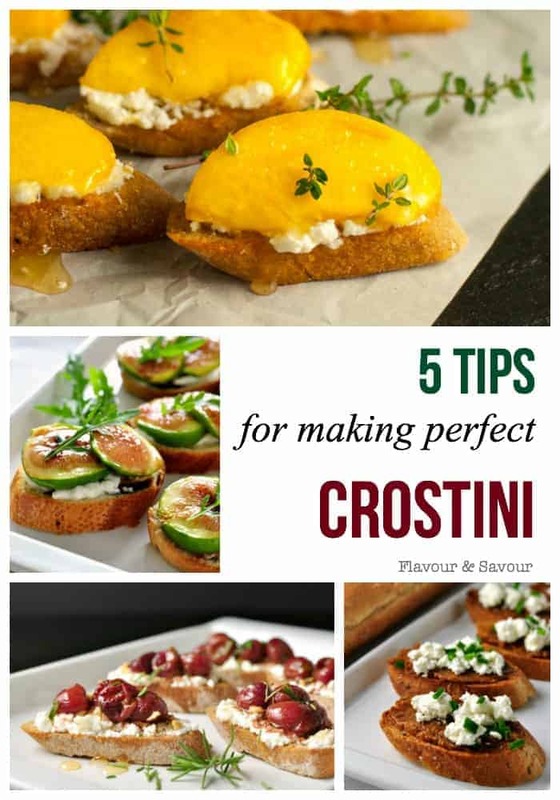 Include some toasted crostini and/or freshly sliced baguette (or gluten-free crackers) to provide a base for the other items. 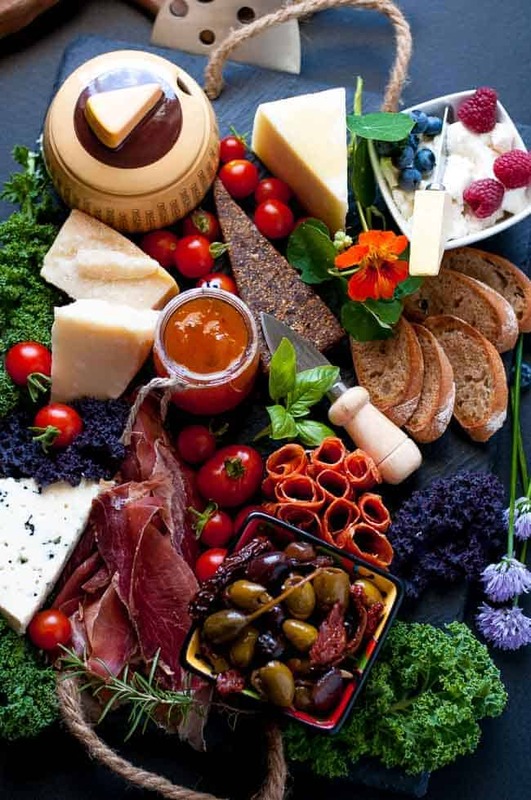 People eat with their eyes first, so take some time to arrange the items on your antipasto platter artistically, instead of lining them up in rows or in a circle. 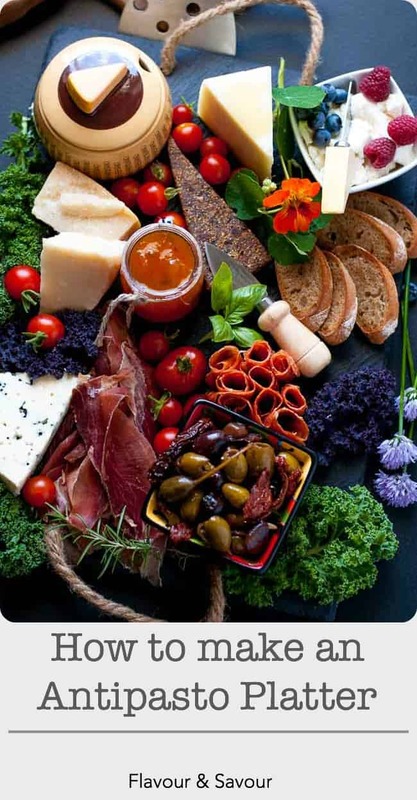 An antipasto platter like this encourages your guests to create their own combinations and mix and match flavours that they like. In this platter, I drizzled honey on chunks of Pecorino, spread goat cheese on a crostini and topped it with peach pepper jam, and savoured slices of prosciutto with chunks of Parmesan and an olive. I included fresh greens, edible flowers and a few tomatoes and berries from the garden to fill in the spaces on the serving board. You can assemble your antipasto well ahead your dinner, but remove it from the refrigerator 30 to 45 minutes before serving time. Cheese has the most flavour when it is served at room temperature. When I’m preparing a dinner party menu, it’s helpful to have an appetizer that consists mainly of store-bought items. This Antipasto Platter is quick and easy to assemble. 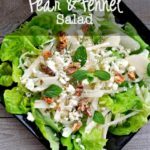 It will keep everyone happy while you’re putting the finishing touches on dinner! Looking for an appetizer platter with a difference? Try this Showstopper Tropical Fruit, Nut and Cheese Platter any time of the year, or this Holiday Cheese and Olive Wreath Appetizer for winter parties. 3 - 4 different types of cheese. Include different textures and cheese made from different types of milk . Arrange all items artistically on a large platter. 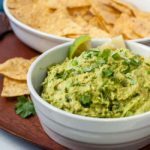 Cover and refrigerate until 30 - 45 minutes before serving time. I’ve been asked several times about the slate cheese board I used to serve this Antipasto Platter. I’ve included a link if you want to purchase one for yourself. I really like this board. I’ve served different types of cheese on it in the past and written the names of the cheeses in chalk right on the board. This post contains affiliate links. If you click on any of the affiliate links and make a purchase within a certain time frame, I’ll receive a small commission. The commission is paid by the third party, not by you. Flavour & Savour is a participant in the Amazon Services LLC Associates Program. It’s an affiliate advertising program designed to provide a means for sites to earn advertising fees by advertising and linking to amazon.com. 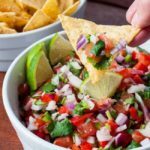 Great tips – these are excellent items to always have on hand so you can entertain unexpected guests at a moment’s notice! I find an antipasto platter is so much easier than fussing with little canapes sometimes! What a gorgeous platter! It looks fantastic. Thanks for the great information. Thanks Redawna! It’s an easy way to entertain! Well, I need a bigger cheese plate now don’t I? This is a lovely and helpful post. Thanks you! Thanks Amanda! lol Anything will do–even a cutting board!